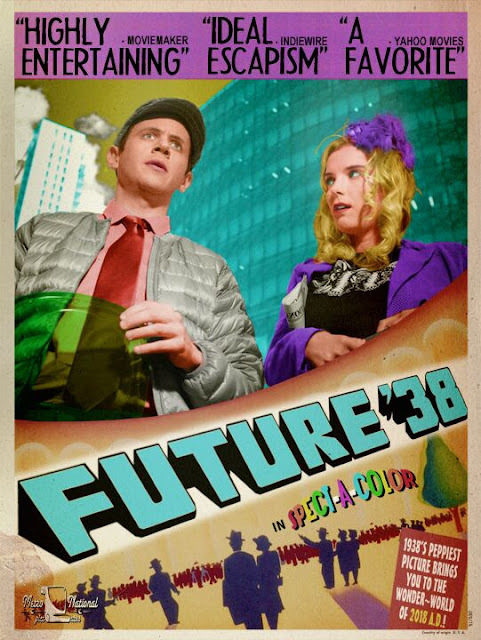 FUTURE '38 was an Audience Award winner at Slamdance this year and will be having its New York premiere on June 8th at the Art of Brooklyn Film Fest. It's a hilarious, screwball comedy and sci-fi throwback to the golden era of cinema about a time-travel adventure which presents the exotic future-world of 2018 A.D., as imagined by the film-makers of 1938. The film stars Betty Gilpin, Nick Westrate, Robert John Burke, Ethan Phillips and Sean Young with a special appearance by Neil deGrasse Tyson. Today my guest on the show is the director/writer of FUTURE '38 Jaime Greenberg. We discuss how the Technicolor "bag of gumballs" that was the color pallet for THE WIZARD OF OZ influenced the look of FUTURE '38, the importance of blurred scratches, our mutual love for HIS GIRL FRIDAY, JOHN WATERS, and the immortal Howard Hawks classic BRINGING UP BABBY. I hope you enjoy my conversation with Jaime.